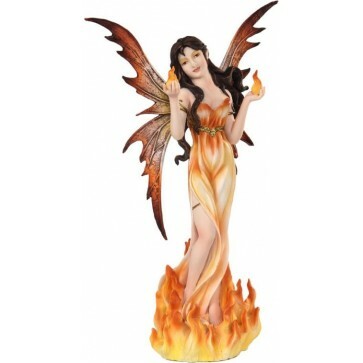 Mystical Elemental Fairy Fire Figurine. Hand painted resin, stands 12" tall. Part of the collectable fairy land legends series. Some fairies dance upon the mountains like a flame. Bring home the Mystical Elemental Fairy Fire Figurine. Hand painted resin, stands 12" tall. Part of the collectable fairy land legends.